The Ghost Rider statue is available for order at Amazon! 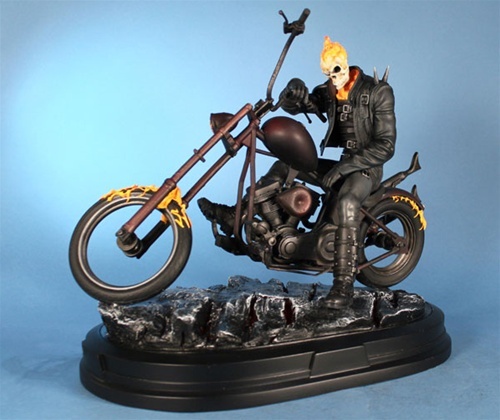 Inspired by the Ghost Rider: The Road to Damnation storyline, this statue arrives for pre-order just in time for the new Ghost Rider: Spirit of Vengeance movie coming to theaters. Ghost Rider is actually Johnny Blaze, who sold his soul to the demon Mephisto and in turn became the living spirit of vengeance in the Marvel Universe. Ghost Rider’s first classic story took place in Marvel Spotlight #5, 1972. This statue stands 12″ tall and features a light-up base, illuminating the flames in the embers the motorcycle rests upon! Leave a fiery trail across the internet when you race to Amazon to order The Ghost Rider statue today!